Text © Copyright November 2008, Thomas Nugent; licensed for re-use under a Creative Commons Licence. Glasgow has more park space per head of population than any other city in the UK. Here is a roundup of the parks as found in geograph. See Glasgow City Council's website for a more comprehensive description. On the banks of the Clyde, close to the city centre, this is Glasgow's oldest park, dating back to the 15th century. The original home of Rangers FC, the park was recently renovated and is enjoying a resurgence in popularity with Glaswegians and visitors alike. It plays host to major events such as the World Pipe Band Championships, marathons, bike races, concerts, fireworks displays and the annual Glasgow Fair carnival each July. 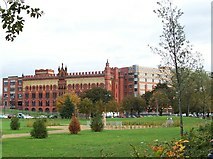 The Category A Listed Link carpet factory was built in stages from 1889 to 1938. Designed in Venetian gothic style by William Leiper, with sections copied from Venice's Doge's Palace. James Templeton and son began manufacturing carpets here in 1857. A cotton mill dating from 1823 is contained within the complex. Further reading at Canmore: Link . Here are just a few of the images of the park to be found in geograph. In the heart of the West End, as the name suggests, on the banks of Glasgow's 'other' river, the Kelvin. Opened in 1852 as the West Park, this is arguably the finest of Glasgow's many parks. It played host to three major exhibitions around the turn of the 19th-20th century. The Friends of Kelvingrove Park website is well worth a look if you intend to make a visit. 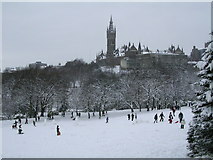 Snowmen and sledgers galore in Kelvingrove Park, after Glasgow's heaviest overnight snowfall in 10 years.